Best Gas Grill for Apartment Balcony -Grills and apartments never really did go hand in hand, not in the past. In the past, if you lived in an apartment, it was rare to find someone grilling out –they were always forced to either cook inside their home or go to the nearest park if they wanted to enjoy grilled food. However, today, thankfully, times have changed, as grills have now become more portable, making them convenient to use on an apartment balcony. Before you start jumping for joy because you get to grill from your apartment balcony, it is important that you familiarize yourself with the rules. Each apartment complex will have their own set of rules and many times, it is as simple as what your landlord allows and doesn’t allow. At other times, it’s the local officials that have fire code laws that will put a limit on what you can and cannot do. Apartment grill rules will usually take the local laws into consideration. 1 Who Do I Contact to Know if I Can Have a Grill on My Balcony? Who Do I Contact to Know if I Can Have a Grill on My Balcony? If you are not sure about your apartment grill rules and don’t know if you’re allowed to use a grill on your apartment balcony, then you need to find out. If you are renting, then you can speak with management at the office. However, if you own it, then you need to look into the condo bylaws. Once you have done this, I recommend getting in contact with the fire department in your area in order to make sure you’re compliant. If you skip this step and choose to use your grill anyways and you’re not allowed, you could end up getting a fine, which isn’t going to be fun. If you live in a state that has strict laws, you may find that you are only allowed to cook with electric or gas grills due to the grill policy. If this is the case, it is important that you choose the type of grill that is compliant with the rules set in place. The average balcony of an apartment is between 6 to 14 feet long and 4 to 10 feet deep. When you are choosing your grill, you need to keep your measurements in mind. With those measurements, you can determine whether you want a standing grill, or a portable grill. 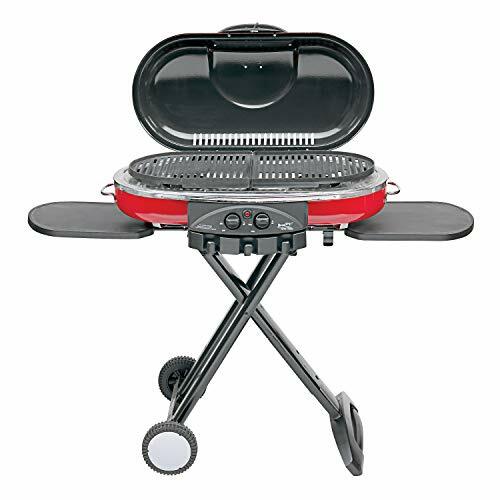 A portable grill is useful on a balcony because they’re small in size, but they may require you to have to squat in order to use it, unless you’re able to place it on a table. For your apartment balcony, I personally recommend a propane grill that is portable. Propane grills will heat up quickly and they’re easy to clean. Yes, they tend to be more expensive, and they will require refillable propane tanks, but it’s worth it if you want grilled food on your balcony. Just because the fire code in your state says it is okay to use compact gas grills, that doesn’t mean your apartment complex is going to allow it. I said this earlier, but I have to say it again – you need to check with your apartment complex. At the end of the day, if you know you’re allowed to use a grill on your apartment balcony, then you can move forward with the plans. You may have grilled a thousand times in your life, and nothing has happened, but that doesn’t mean you should leave the grill unattended. Think of the grill as if it’s a kid in a swimming pool, you wouldn’t ever leave a kid unattended, not even for a minute. In order for an accident to happen, all it takes is one gust of wind to blow some ashes out of the grill. If the grill is electrical, it can be even more dangerous if it were to get knocked over or there’s some sort of mechanical failure. If for some reason you need to step away from the area for a bit, make sure you have another person that can watch the grill while you’re gone. Many accidents are due to people not knowing how to use the grill. Before you use your grill, make sure you have a good understanding of how it operates. If the grill is already going, don’t add lighter flood. Keep cords away from the grill. For electric grills, plug them into a grounded outlet. After each use, clean the grill grates in order to remove the grease. For gas grills, make sure the propane is turned off when you’re done using it. It is important that you take the above tips into consideration. Once you get the go-ahead to use a propane grill on your balcony, I recommend a portable one. Even if you live in an apartment complex, with this stylish gas grill from Cuisinart, you’ll be able to enjoy delicious grilled food every day. I love how tiny this grill is – it’s so small that you can use it on every balcony, making it super convenient. The Cuisinart Petit grill runs off of propane and has a twist start ignition, making it easy to light. While the grill may be small in size, don’t let that fool you, because the grate is large enough to be able to cook a meal for most families. It is capable of fitting 8 hamburgers, 8 steaks, 6 chicken breasts, or a little over four pounds of fish. Most of all the main reason this grill made the list – it’s portability features. The legs are capable of being folded up, then the lid has a useful lid latch, a carry handle and don’t forget the spill resistant drip tray – all of those are responsible for making this grill portable. When it comes time to cook, you’ll be surprised at just how quickly this little grill heats up, and I really like how it doesn’t use as much gas as those full-sized grills. Once you have the food on the grill, it will give that nice even cook, unlike some of the other small grills on the market. It may be small in size, but it cooks just as good as a large grill would. At the end of the day, if you feel like escaping your apartment balcony for a little while, you can take the Cuisinart petit gourmet grill too so that you. Whether you’re tailgating, going to the beach, camping, fishing, or hiking, you won’t have a problem carrying it with you. It’s super easy to clean and has a grate that you can remove and put in a dishwasher. You probably already expected to see a Coleman grill on this list, because the brand is well known for making high quality outdoor products. For over seventeen years, they have been creating portable grills that really stand up to the crowd. 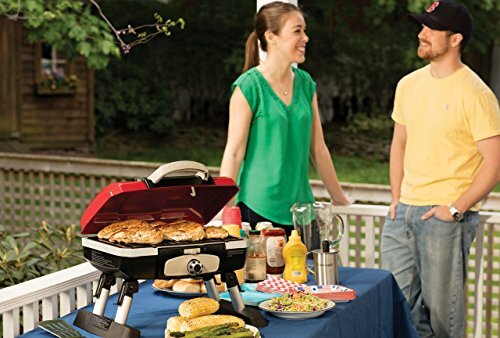 A suitable propane grill for your apartment balcony would be the Coleman RoadTrip portable gas grill. With this particular grill, you’ll have a set of dual burners that can be adjusted in order to give you control. The cooking surface adds up to a total of 285 square inches. With 20,000 BTUs of cooking power, you’re certainly not going to be lacking. So let’s talk about what we’re all here for – the portability. With the Coleman RoadTrip, portability isn’t going to be an issue. In fact, it was built with portability in mind. The wheels fold up for a nice compact storage. I really like the sliding tables on each side of the grill. This makes it easy for you to keep ingredients and tools close by. When you’re done with the side tables, you can just slide them back in. The cast iron grill grates are another feature that makes this grill worth it. It comes with 2 cast iron grates that are porcelain coated. They’re durable, interchangeable with other cook tops and in the end, they’re easy to clean. There’s a removable drip tray, which makes it even easier to clean – in order to prevent heavy buildup, it is recommended that you clean the drip tray on a routine basis. Let me elaborate a bit about the interchangeable grates. With the interchangeable grill grates, this means you can switch between stove and griddle grates – those grates are sold separately, but the cast iron grate comes with the grill. When you’re ready to set this little cooker up on your apartment balcony, it’s really easy and can be done in less than two minutes. 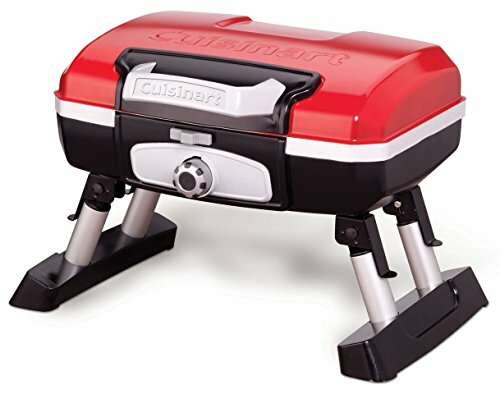 The Coleman RoadTrip portable gas grill is great for people that have small patios and don’t really want the normal large propane grill. When it’s all said and done, kit can easily be stored away to protect it from the outdoor elements. It is capable of cooking anything from a nice quick lunch to food for a small dinner party. 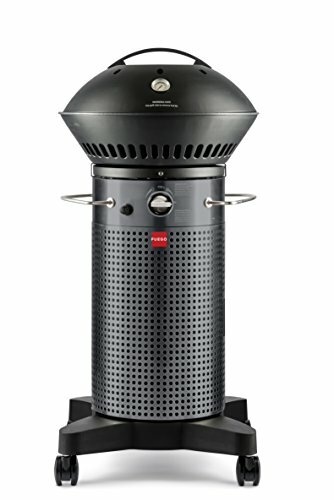 Weber is another brand of grill that I couldn’t help but to include on this list. Weber chose to re-style an already existing product – that’s when the Q100 was transformed into the Weber 50060001 Q1000 Liquid Propane Grill and I feel this grill would be perfect for an apartment balcony. The size and design of this grill just screams “Weber.” As you may already know, Weber is well known for their beautiful looking products. This grill is 16.16 inches wide and stands at 16.32 inches tall, complete with a depth that is 28.41 inches. Comparing it with the Q100, it’s a tad bit bigger, but that’s one of the improvements because it now has larger knobs and handles, which makes it easier to operate. As an additional bonus, it only weighs 28.5 pounds, so it isn’t hard to carry out to your balcony. With its sleep modern look, it is obvious that this grill is well-made. The looks aren’t the only thing this grill has going for it though. Performance is another thing you’re going to like about this grill. Upon ignition, this grill starts to heat the entire cooking surface – a nice even heat, whether you have it on low or high. So, if you’re looking for a grill that will evenly cook your food, then this would be suitable for you. Many people like how this cooker is fully assembled from the very beginning. That’s right, as soon as you pull it out of the box, it is ready to go. Gone will be the days where you had to sit there reading endless instructions as you’re trying to figure out how to put a grill together. All you have to do is open the box, slide it out, connect it to the propane tank and you will be ready to go. I also like how this cooker is available in different colors. If you don’t like the silver cook, that’s no problem, because you also have green, fuschia, black, orange and blue to choose from. Depending on your cooking preferences, you can set this grill on a small table or the ground, but I personally like putting these type of grills on the table. There’s a total of 189 square foot of cooking space, which is perfect for families. You can easily invite some people over for dinner, cook up 6 steaks and have no problems. Mind you, there’s only one burner, so you’re not exactly going to be cooking for a large party on this grill, but if you’re just looking for a grill to use for lunch or dinner on your balcony, this is perfect. Wherever you cook with this Weber, it’s not going to take up a whole lot of space. 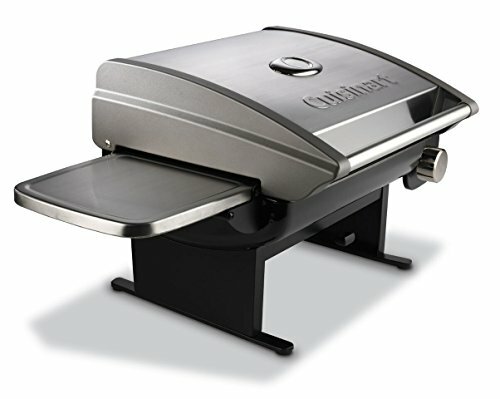 The Cuisinart All-Foods CGG-200 grill is another portable grill that would fit on your balcony apartment. The design is something that really caught my eye – it’s a very nice high performance grill. The grill isn’t the lightest portable grill on this list as it weighs in at 77 pounds, but it’s still portable. 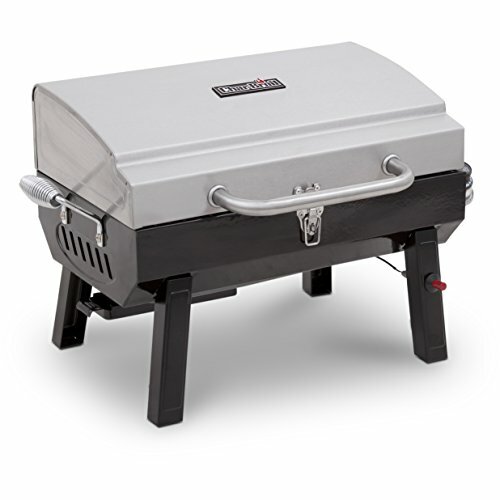 This propane grill is made of a combination of aluminum and stainless steel. It stands 19 inches high, and is 41 inches wide. The main focal point would be the Cuisinart lid – it looks amazing. When you’re ready to cook, you’ll enjoy the Piezo ignition – that means with one touch, it’ll be lit. In due time, maybe every grill will have the Piezo ignition on them. Within 7 minutes, it can reach a temperature of 500 degrees Fahrenheit, which is great. The large temperature gauge is located on the hood, making it easy for you to check the temperature of the meat you’re cooking. The panels connect securely to the grill, but when it comes time to remove them, you can do so quickly. There’s also a removable drip tray, making it easy to clean. This Cuisinart propane grill also has folding shelves on the side, so you can put your tools and food within reach, which is super convenient. The thermometer that is built into the lid will give you precise readings so that you can easily control the heat. This cooker is compact enough to be able to use on every apartment balcony, and it can feed between six to eight people. When you go out on your apartment balcony and you grill, you want to have good food, right? This can be achieved with the Char-Broil Deluxe Gas Grill. This particular cooker deserves its spot on this list because it was designed for people on the go. The legs fold over the grill in order to lock the lid in place when you’re done and it even has heat-resistant handles, which makes it so that you don’t have to sit there and wait for the grill to cool down before you move it. With 190 square inches of cooking space, you should have more than enough room to cook a yummy meal for your family, and maybe even a couple of guests. The 11,000 BTU burner can be used with a 14.1 ounce or 16.4 ounce propane cylinder. There’s a convenient hook, which will allow you to hang the lid up while you’re cooking. The rust-resistant steel firebox makes it so that the grill will last for a long time, and if you take it off of your balcony when you’re done with it, it’ll last even longer. When you’re done cooking the food, you can fold it up and store it. 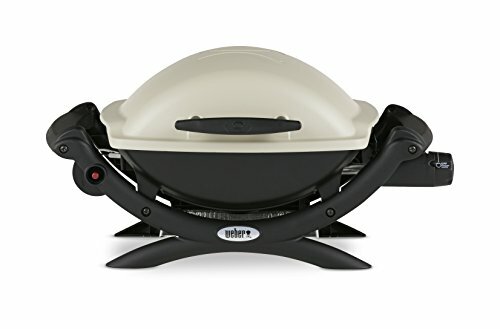 If you’re the type of person that really wants to enjoy some good home cooked grilled food, but you don’t have that much money to spend and you want something that will easily fit on your apartment balcony, then this would be a great grill for you. Stepping it up a notch and looking in the unique department, we have a gas grill from Fuego. This grill was designed by Robert Brunner, who just so happens to be the former Apple Chief Designer. He also won the Vesta’s Best Gas BBQ and Spark Design Award, so it’s obvious that he knows a thing or two about designing grills. The Fuego propane cooker can reach a high temperature of 500 F within only 5 minutes – it goes up to 650 F. The porcelain-enamel cast iron grate weighs 15 pounds, and is capable of giving your steak a nice sear mark (the type we’d expect from a fancy restaurant). When it comes to cooking, you will have 346-square inches of space to work with, which is more than enough space for a large family. You could easily cook up to sixteen hamburgers all at one time. So, if you and your family, along with some guests are wanting to enjoy the nice weather on your apartment balcony, it’s safe to say you can do so with this grill. The grill has a hinged door where you can store the propane tank – this means you don’t have to carry the propane tank separately, you can just store it under the grill. When you have the grill on your balcony, you don’t have to worry about the wind pushing it away, because it has a nice set of anti-lock wheels in order to make sure it will stay in one spot. Yes, this may be a bit on the expensive side, but the price is well worth it due to the efficient technology nesting behind it. A grill like the Fuel Element is a great choice, but be prepared to pay for it. The efficient technology used in this grill explains why it is one of the higher priced items on the list. The hinged door feature is pretty cool because it keeps the propane tank closed up, so you don’t have to look at it. In addition, the impressive anti-lock wheels will ensure that the grill will stay in one spot. With 11k BTUs of power, you’re going to be thankful for this grill on your balcony. Once you taste the food it is able to cook, you’re going to be even more thankful. As long as you choose a grill from the above list, you can rest with the satisfaction of knowing you made the right choice. This is because each one of these grills has been thoroughly researched and combed over with a fine-tooth comb by me. When I was picking out the grills, the main things I looked for were quality, portability and ease of use.